That is just one of the many thought-provoking asides offered by Piotr Masztalerz Sensei of Wroclaw Aikikai last month at a dynamic seminar at Brooklyn Aikikai. Masztalerz, rokudan Shidoin and a leader of Polish Birankai, brought his innovative approach to ukemi, technique and weapons to the U.S. for the first time at a major seminar. 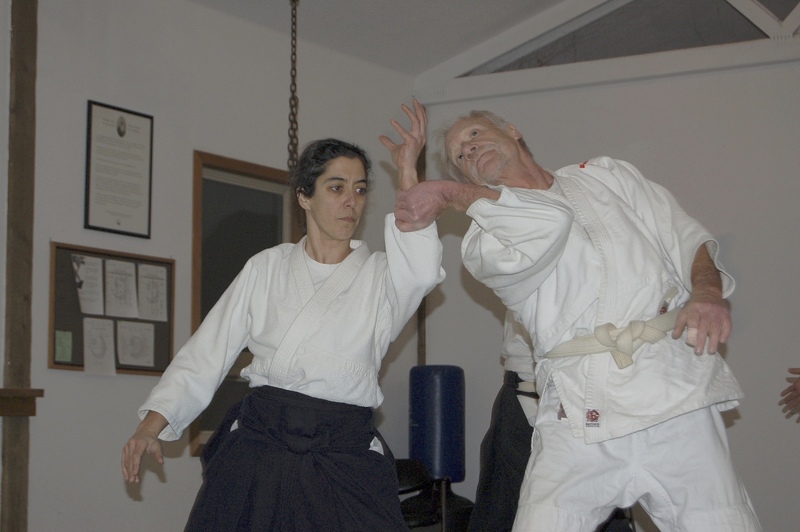 Masztalerz studied intensively with Chiba Sensei both as an uchideshi in San Diego in the early 2000s and as a leader of European Birankai who attended many seminars and hosted him for several large camps in Poland. 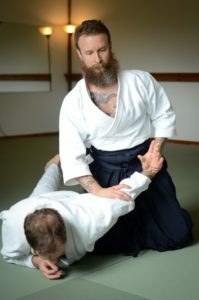 With a large full-time dojo and hundreds of students, Masztalerz devotes himself to all of the elements of Birankai Aikido practice, with a special emphasis on the study of ukemi. His home base of Wroclaw (pronounced “vrots-wahf”) in western Poland hosts a lively scene that brings together actors, dancers, motorbike drivers and a range of martial artists in the study of movement at Wroclaw Aikikai. 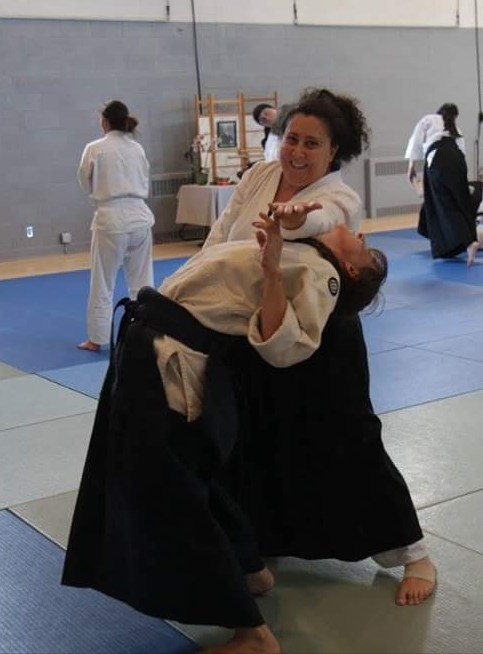 Ukemi should be challenging and gymnastic at all levels in Aikido, Masztalerz says, with the intent of freeing up the body’s potential and exploring the art on a deeper level. Beginners need to learn practical falling skills from the very beginning or they won’t come back, he adds. 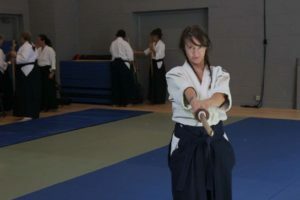 Also important is that senior students push themselves at all ages to maintain their conditioning and try new ways of taking ukemi and executing techniques. Stay tuned for a longer interview with Masztalerz Sensei here in coming weeks; see more videos at the Birankai Aikido Video Channel and the New Haven Aikikai Video Channel on Youtube. Find out more about his book in Polish about his lifelong study of Aikido here. 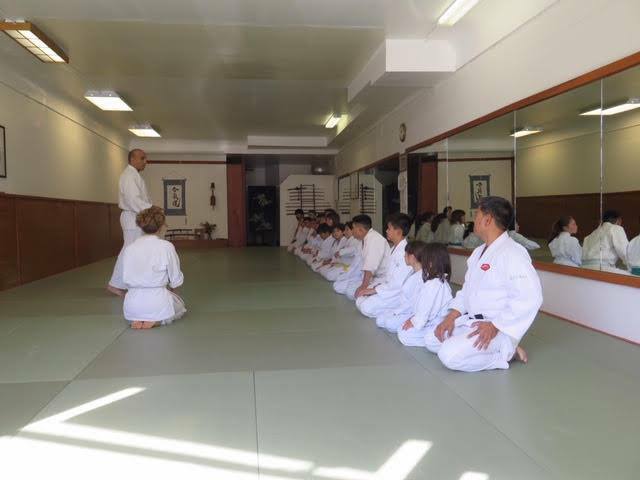 Philip Vargas Sensei of Aikido of Albuquerque taught a special seminar for kids at Aikido Institute of San Francisco on Oct. 13. The group photo from the event is post above in the header for this blog. Birankai Aikido Europe instructors at 2018 Summer Camp in Germany. 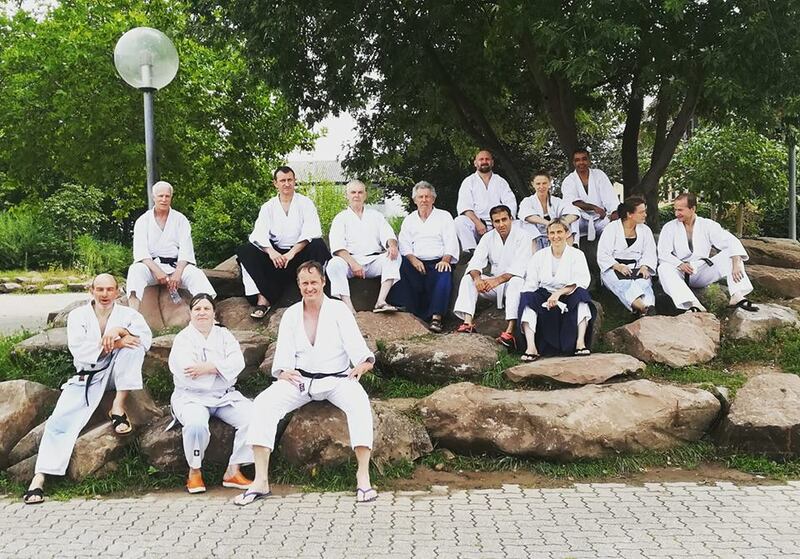 Our friends in Birankai Europe are having their Aikido Summer Camp this week and the teachers posed for a nice photo in Germany. We gathered up some teachers for our own Birankai North America photo, trying our best to look Euro-cool in the bright Tacoma sunshine. We send our love to our European friends and hope to see you all soon! Some of the teachers at Birankai North America Summer Camp this week. 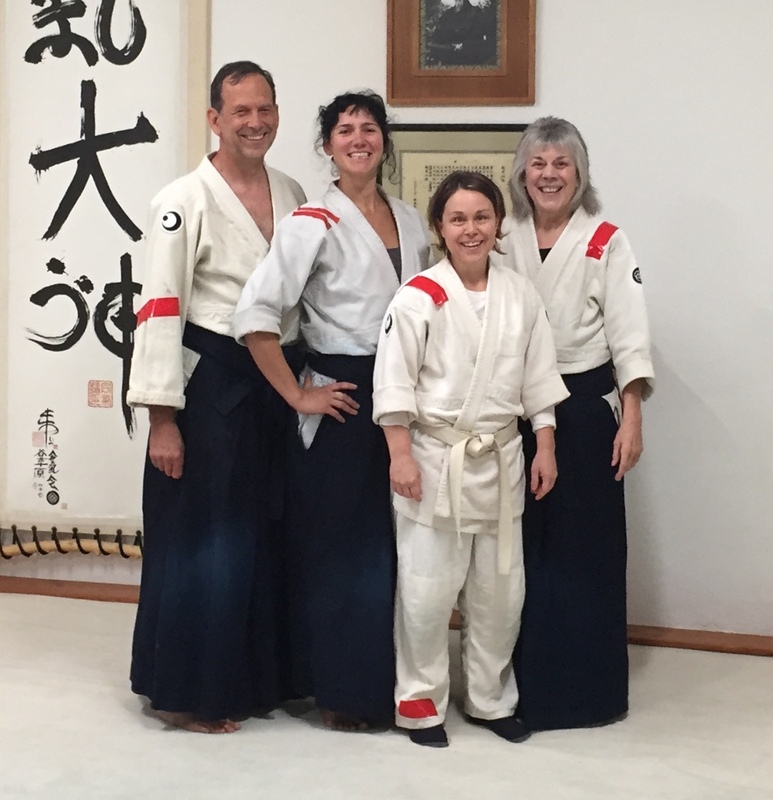 Chief instructors Malory Graham of Seattle Aikikai, Liese Klein of New Haven Aikikai and Ea Murphy of Tacoma Aikikai collaborated on a workshop at Seattle Aikikai on July 14, 2018. 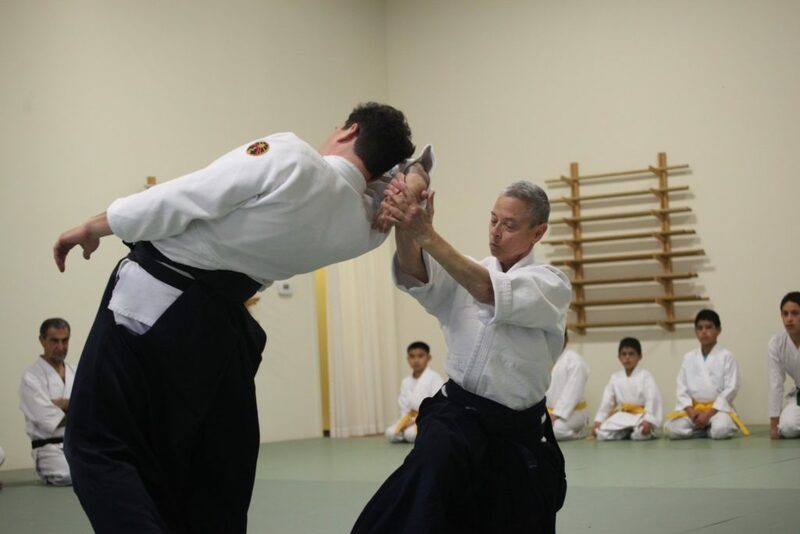 The event focused on the Seattle Aikikai monthly theme of “exploring levels.” Graham Sensei and Murphy Sensei worked with the katatedori, morotedori and ryotedori grabs while Klein Sensei led students through the basics of the Sansho 2 jo kata. More video clips from the event are on the Birankai Aikido Video Channel on YouTube. If you are in Tacoma early for Birankai North America Summer Camp, be sure to visit Tacoma Aikikai, Murphy’s thriving dojo downtown. Classes are on until the start of camp; the schedule is here. If you’re a bit north in Seattle, stop by Seattle Aikikai, where Graham Sensei welcomes Birankai members with a warmth and appreciation. The schedule is here. 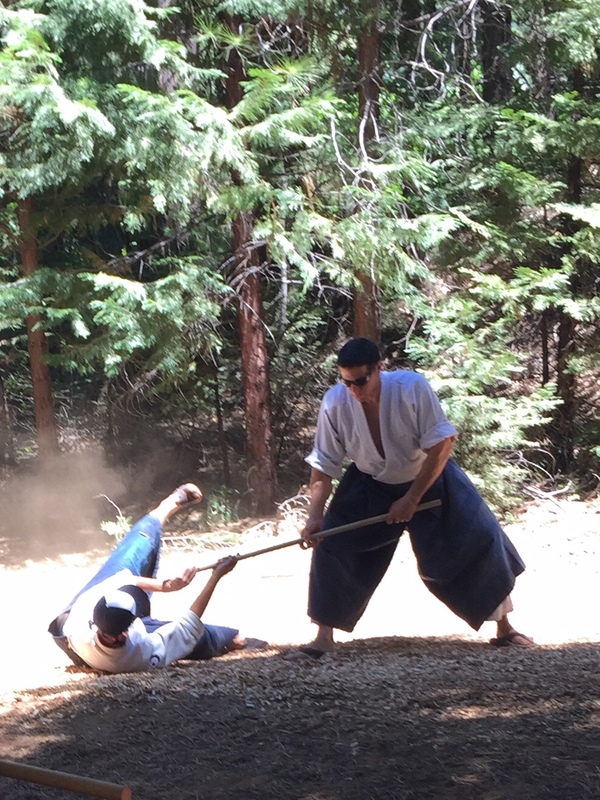 All Aikido practitioners of all affiliations are welcome at Birankai North America Summer Camp and it’s not too late to sign up. Drop-ins are also welcome as commuters. Sign up here and see everyone at camp! If you’re shopping on Amazon for Prime Day this year, don’t forget to help Birankai North America through the Amazon Smile program. Amazon donates 0.5% of the price of your eligible AmazonSmile purchases to the nonprofit organization of your choice, and Birankai North America is on the list! Just check out the Amazon Smile page and be sure to type in Birankai North America when prompted to enter a nonprofit. We use that money to pay for scholarships, grants and training events like Summer Camp and Instructors’ Intensives and we need every cent! Thanks for your support and happy shopping! Check out this great newsletter put out by Birankai Europe in both English and French. Our Birankai North America newsletter, Biran, will be available at Summer Camp with great articles on the theme of “The Art and Science of Aikido.” Also find out in detail what the Exam Committee is looking for in tests — make sure someone from your dojo picks up your copies! Frank Apodaca Shihan at the 2018 Mountain Weapons Seminar. 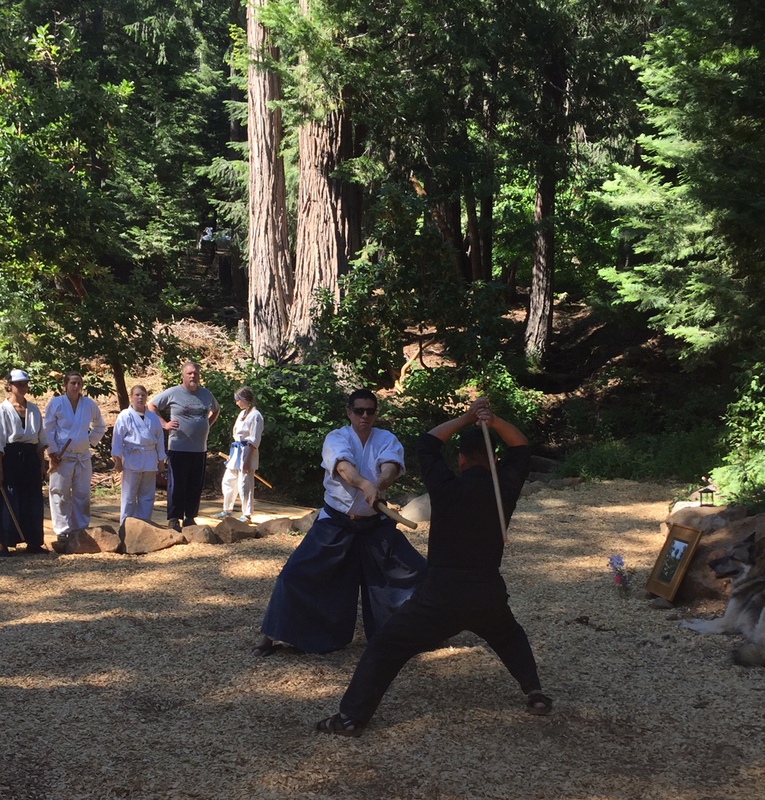 Thirty students gathered at Grass Valley Aikikai Chief Instructor Cecilia Ramos Sensei’s home, ten acres ten miles into the Sierra Nevada mountains, for the 2018 Mountain Weapons Seminar with Frank Apodaca Shihan of Deep River Aikikai. 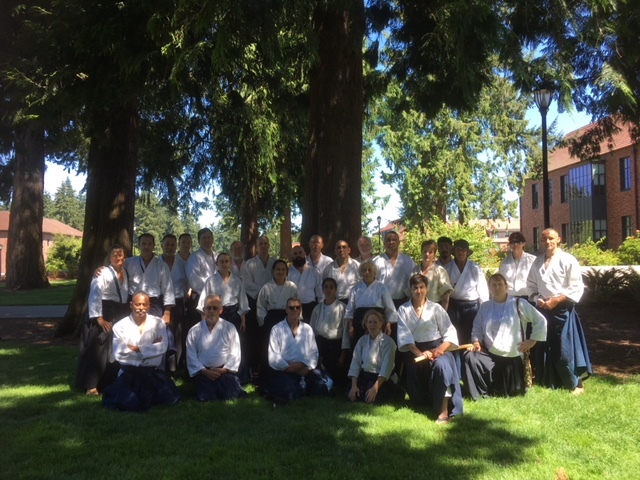 We were pleased to host students from San Diego Aikikai, Summit Aikikai, Alameda Aikikai, and Aikido Institute of San Francisco, along with visitors from Chico. The importance of correct usage of the feet and twisting movements, was the theme of the day. With jyo in the morning and bokken in the afternoon, basic strikes and movements were reviewed. 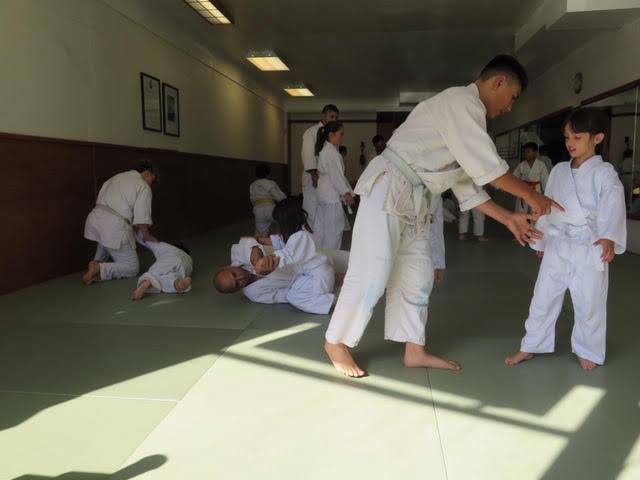 There were beginners and youth, so the material was appropriate for their level, yet by the end, the senior students realized the teaching was thoughtful and presented a deep understanding that Apodaca Sensei has developed through his personal training. After the last class, kids and dogs went swimming. Then the make-your-own pizza party got started! Afterward, some people had to get home, but lots stayed for a campfire and conversation. The next morning those that were still around had an unplanned class at the dojo. It was interesting to apply the footwork and twisting themes from the day before to body arts. 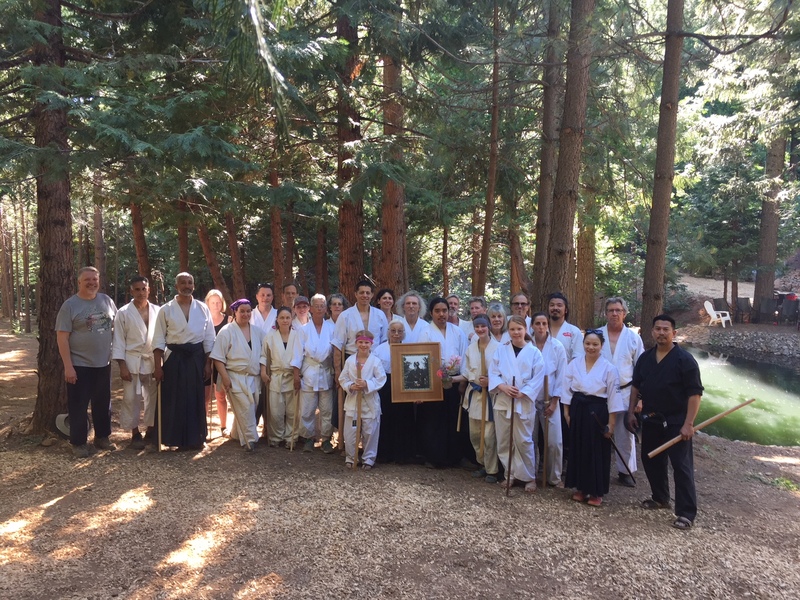 The day before the seminar Apodaca Sensei visited Grass Valley Aikikai and conducted a shodan test for Marci Martinez, who passed. We were so happy to include out of town guests and all visit together over tacos at the dojo. Looking back, we realized that while we officially hosted a one day seminar, that in reality it turned into a three day event. So we decided next year we should just turn it into a proper three day seminar – Friday night, all day Saturday, Sunday morning! We invited Apodaca Sensei to come again and he said he would! So make your plans – probably next year the weekend after Father’s Day. Why not make a vacation of it? 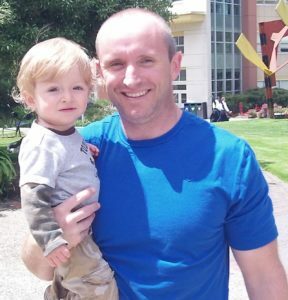 Bring your family and spend a week seeing the sights and enjoying the beautiful Sierras. Do come if you can. Everyone is welcome. Spring is the busy season for major Aikido events in Japan, with the annual visit to the Iwama Aiki Shrine one of the highlights. Check out the video above featuring Moriteru Ueshiba Doshu along with Mitsuteru Ueshiba, Doshu’s son and the great-grandson of the founder. Below are some clips from the other big spring event, the annual all-Japan Aikido demonstration, or Embukai. Below are clips of Birankai favorite Yoko Okamoto Sensei and Akira Wada Sensei, a longtime student of Chiba Sensei’s from Tashiro Dojo in Nagoya. 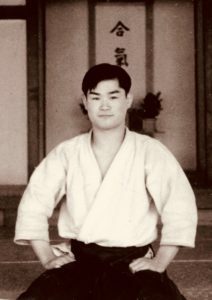 Wada Sensei started studying with Chiba Sensei in 1963 at Tashiro Dojo, which also served as an early training ground for another young Hombu Dojo instructor: Mitsunari Kanai. Check out the many high-quality Aikido clips from Japan on the Seido channel on Youtube, in addition to lots of other video of arts including Yagyu Seigo Ryo Batto, Shibukawa Ichi Ryu Jujutsu and Chokugen Ryu Onaginata Jutsu. 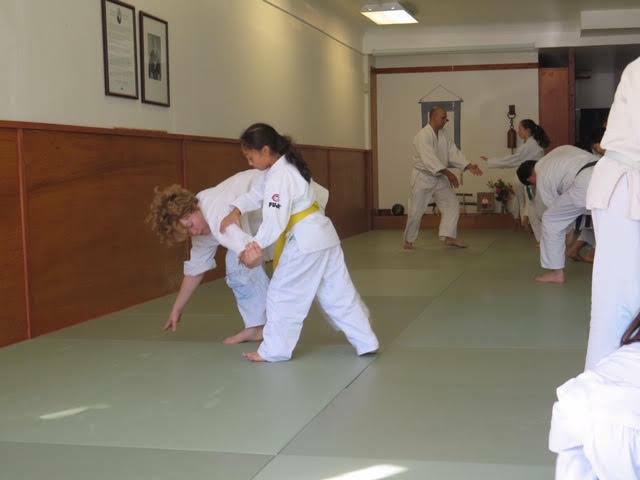 Does your dojo have a children’s or youth class? What keeps your kids coming back? What kind of successes or challenges are you having within your classes? These are some of the questions and concerns that the leadership of the BNA Youth Program Team is endeavoring to help all BNA dojos with. We all know that the youth are our future. Starting a youth program (we say YOUTH across the board from the youngest to 20 years) and keeping it going and growing is a unique challenge for all dojos. Over the last three years we have been creating opportunities for our Birankai community to become more involved and cohesive in the integration of successful youth programs for every dojo. Having read Stephen Hawking’s “A Brief History of Time,” I can assure you this will be nothing like it. Rather, this is a personal reflection of my own Aikido’s progress over time. In summary, I think introspective thinking and maximizing seminar attendance have been valuable tools for my own progress. Before proceeding, I think it’s important to briefly define progress – or rather, not to. To many people, progress has different meanings depending on one’s training purpose, their experience and expectations and perhaps where one is at during that moment of training. We use words like becoming rounder or softer, learning or letting go, shu ha ri, beginners mind, etc. There is no end to the discussion one could have defining “progress” and this is not within this paper’s scope. Rather, the intent is what progressing has meant for me and likely, what progress could mean for others in the absence of time; regardless of one’s definition. Like many – I’m busy. 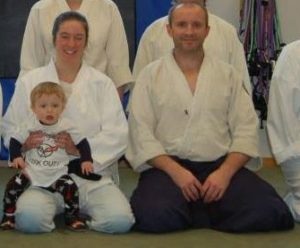 There once was a time (I can now hardly remember) when my wife and I spent much time training at the dojo, attending most seminars within driving distance and going to summer camps. Time was filled to the brim with Aikido conversation, videos and of course – practice. I can even remember going to a spa for a weekend date and learning Sansho I, Part I, on a beach. Time was plentiful and being dedicated required only a selection within choice. In 2012 however, this all changed. In 2012, we welcomed the birth of our boy Raven. Here, like Hawking’s black hole, so too began the steady and constant demise of time. As time to eat and savor one’s food became non-existent, so too did the ability to remain entirely focussed on training. One does not appreciate time until it’s taken away, or as Shakespeare would better phrase, “O, call back yesterday, bid time return.” So then arose the struggle – how to progress in the absence of time? During the first two years of my child’s life, my training stumbled. I attended every class at the dojo and did attend a few seminars and a summer camp. However, with a “new dad” focus and nightly sleep that amounted to less than what a rocket would take to reach the stratosphere, energy was lacking. Emerging from that for me, would require a new definition of training and hence a new way to progress. The first change I made to my training was the intentional use of introspective thinking. This is nearly obvious as we do it all the time, especially when doing menial tasks. What was different however was not merely slipping into the thoughts but intentionally becoming determined to use my “time” more productively when off the mats. Time included watching my kid nap, completing work around the house, biking to work, walking, etc. 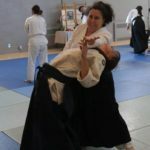 This time would now involve intentional thoughts towards Aikido techniques. I think introspective thinking is useful on many levels. First, can the body perform what the mind cannot create? Reinforcing what I (think I) saw is an important mental practice. I noted “think I” because as I have progressed, this too has changed. Without going too far down a rabbit hole, one could argue that this must change or one would become fixed or lost within ego or without progress. For me, the evaluation of what I “think I” saw often occurs off the mats within this type of thinking. Further, the mental regurgitation of technique is especially important when time on the mats is limited. For example, I bike most days to and from work. This journey gives me time to mentally practice Aikido techniques. I usually give myself a goal; today I have to recall eight gyakuhanmi katatedori kokyunage techniques. This brings forward a memory bank of past classes, seminars, videos, etc., all to recall what I can. From here, I sometimes check my technique before or after class with a willing aikidoist. Naturally, from this there are lessons learned to improve my technique on the mats, in my head, or to seek advice. Introspective thinking has therefore been essential for my own progress. My other progression tool has been maximizing the attendance of seminars. 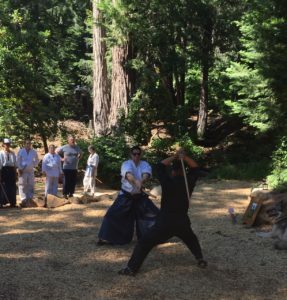 If we look at O Sensei’s quote “the purpose of training is to tighten up the slack, toughen the body, and polish the spirit;” it all exists at seminars. First, seminars break the repetitive nature of time. As days blend into months and years, one’s largest progress may be their child’s weight and height. Within a regular training schedule, work and family priorities tend to creep in and steal the remaining time that has already been marginalized. Setting one’s calendar towards a seminar is like a (narcissistic) vacation. It forces one to dismiss these time pirates and refocus, even if briefly, one’s attention to training. Seminars also enable one to train with a variety of different ukes and instruction. Frank Zappa once said “without deviation from the norm, progress is not possible.” Similarly, regular training at a dojo is important but it has limitations. Ukes may be new to the art or conversely, may anticipate through familiarly. In addition, similar bad habits may reinforce each other. Finally, despite one’s Sensei constantly repeating the same corrections, it may be at a seminar where the error is finally “seen”. It may be through a variation in teaching or (and likely) that in that moment one was focussed enough to grasp what had repeatedly been shown. Unlike regular training, seminars also require an increased and prolonged physical requirement that leads to a decreased physical and mental ability. Musashi is often quoted as having said “you can only fight the way you train.” Training under exhaustion is vital and requires practice. Training under exhaustion enhances progress by forcing one to “let go” of all those unnecessary muscles that are used to cheat techniques. One is therefore, forced to “find” Aikido technique. As a generally physically strong person, without the exhaustion of seminars, my own progress would surely have been limited; and much more exhaustion is still required. Finally, seminars allow one to experience and support the bigger Aikido community. This time spent together off the mats may seem irrelevant to progress, however this would discount the power of motivation. Most people are more productive when motivated. Seminars for me stimulate excitement towards the art and motivate me to want to train more; not with the intention of progressing, but to enjoy the training as it is. Progress at or following a seminar is therefore merely a side-effect of training. So how does one progress in the absence of time? There are many different methods to be sure but for me, introspective thinking and the maximum use of seminars have been two tools that I have relied on. To finish, I’d like to end with a quote from one of my favorite guitar players Steve Vai, “passion eliminates time.” If you have the passion, you will somehow find the time. This is a rolling sequence video for aikido practice and teaching. 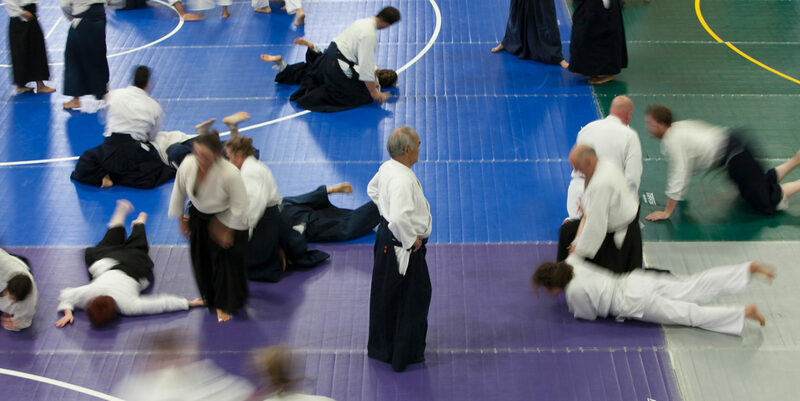 Beginning Aikido students are often introduced to rolling practice in their first week on the mat. The experience of getting down on the ground and coming up again is fundamental and yet also instinctive. New students have so much going on mentally, emotionally and physically as they begin a new movement practice. Small rolls, sometimes called “Bucky Ball” rolls or “baby rolls” offer teachers a rich opportunity to orient the new student, practice learning skills, foster attention skills and give them something they can do successfully and improve upon quickly. For more senior students, the practice serves as a mental and physical warm up, calming the nervous system and relaxing the body. Bringing attention to what you do and how you do it, matching your breathing to your movement and varying your intention in movement are all excellent ways to prepare yourself for aikido practice. 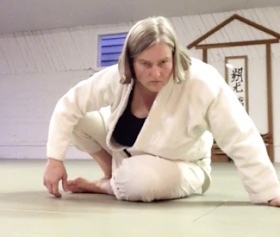 In this quiet (no-talking) video, Suzane Van Amburgh Sensei demonstrates a rolling practice sequence useful for all levels, from beginner to senior student. It begins with orientation to the relative position of body parts, rocking left and right. It progresses through use of weight shifts, finding the natural levers and counterbalances of the body, smooth transitions from sitting to side lying and up to sitting again. By the end of the video, the roll has evolved to advanced sequences requiring clear intention, core conditioning, good body control and awareness of the space around you. 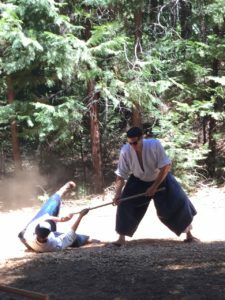 Let this post serve as a reference tool and “cliff notes” for aikidoists in your regular rolling practice. If rolling is new to you, don’t try this alone. 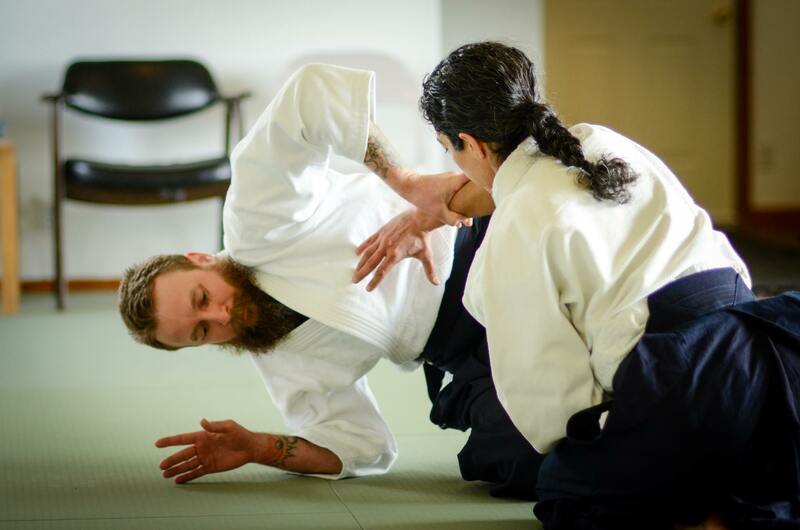 Come to the dojo or schedule a private lesson with a certified aikido teacher. Recently, I had the great fortune of attending a Clallam Aikikai Aikido seminar taught by Frank Apodaca Sensei in Carlsborg, Washington. It was my first seminar since I returned to training in Aikido after a six year hiatus. Six years – it may not seem like a long time. But time off the mats and aging (I’m 63) act like a slick pick-pocket – taking your valuables from you and you have no clue that they are even gone, that is until you need them. So with a bit of trepidation I signed up for the 3-day training hoping that my stout-hearted spirit would indeed shield me from the feelings of awkwardness, lack of memory of techniques, and the aches and pains of hard workouts. I also volunteered to host visitors attending the seminar from nearby Victoria, Canada. 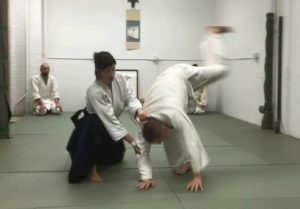 The seminar began on a Friday night – suwari waza techniques. I’m thinking that my training is back to square one; just do your best and don’t sweat it if you make lots of mistakes. Throughout the session Frank Apodaca Sensei stressed the basics of good techniques; stance, posture, movement, position, timing, breath, completeness of techniques, and a martial attitude. For the entirety of the seminar the basics would be the mantra of the seminar. The seminar ended Sunday afternoon with a pot-luck on Saturday night. As it turned out my visitors from Victoria, Maggie and Jody, were a couple that had stayed in my house about 6 years ago. When we met at the seminar it was as though we had just seen each other yesterday, not like 6 years had gone by. It was truly reconnecting with friends. Also traveling with them was their son Raven and one of their students, Paul. We all became really good friends. This brings me back to the wise words of O’Sensei. As a student with a huge amount of “slack’ in my techniques, this seminar was just what I needed as a retuning new student. I definitely took in as much as I could and “stole” from black belts what they offered to me. Yes, my body ached on Monday (and Tuesday too) but I like the feeling of testing my body and learning to adapt to the limitations that I now have. After all I’m in it for the long haul. However, for me the words “polish the spirit” really ring true. The basics really extend not just to techniques and training but also to developing and renewing friendships, camaraderie, and the shared excitement of friends getting promotions. All of these activities are polishing (and rekindling) the spirit. I want to thank Frank Apodaca Sensei and Neilu Naini Sensei for bringing this seminar on “the Basics” to Clallam Aikikai. I could not have enjoyed it more. Have you ever incurred a strain or sprain? What’s the difference really and what can one do about it? During an intensive training session we sometimes push a little harder, reach a little farther and an injury can occur. 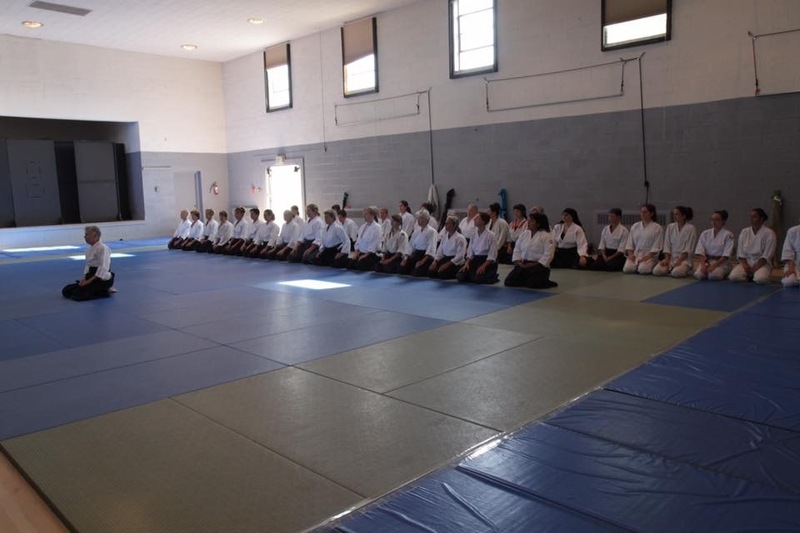 After a period of intensive training (such as Aikido summer camp), there is also a risk of suffering an injury as you return to your regular training schedule. Even regular daily activities can trigger an injury after a period of intensive training. People often report that they were “doing nothing” at the time they incurred the injury. After further inquiry it is revealed that the person recently engaged in intensive physical activity or an unusual use of self (eg. we moved last weekend or I went white water rafting for the first time). Whether you have an injury now or you recently trained intensively, I encourage you to read this excellent article below by my colleague Mike Doren. Sprains are injuries that affect ligaments. They occur in response to a stretch or tear of a ligament. Sprains are an acute type of injury that results from trauma such as a fall or outside force that displaces the surrounding joint from its normal alignment. Sprains can range from a mild ligament stretch to a complete tear. Bruising, swelling, instability, and painful movement are common symptoms experienced after a sprain occurs. Sprains occur most often in the ankles, knees or the arches of the feet. Sprained ligaments swell rapidly and are painful. Generally, the greater the pain is, the more severe the injury is. For most minor sprains, you can probably treat the injury yourself. If you heard a popping sound at the time of the injury, have a fever or aren’t improving within a couple of days, seek medical treatment because inadequate or delayed treatment may cause long-term joint instability or chronic pain. Strains are injuries that affect muscles or tendons. They occur in response to a quick tear, twist, or pull of the muscle. Strains are an acute type of injury that results from overstretching or over contraction. Pain, weakness, and muscle spasms are common symptoms experienced after a strain occurs. A sprain can result from a fall, a sudden twist, or a blow to the body that forces a joint out of its normal position and stretches or tears the ligament supporting that joint. Typically, sprains occur when people fall and land on an outstretched arm, slide into a baseball base, land on the side of their foot, or twist a knee with the foot planted firmly on the ground. Although sprains can occur in both the upper and lower parts of the body, the most common site is the ankle. More than 25,000 individuals sprain an ankle each day in the United States. The ankle joint is supported by several lateral (outside) ligaments and medial (inside) ligaments. Most ankle sprains happen when the foot turns inward as a person runs, turns, falls, or lands on the ankle after a jump. This type of sprain is called an inversion injury. The knee is another common site for a sprain. A blow to the knee or a fall is often the cause; sudden twisting can also result in a sprain. Sprains frequently occur at the wrist, typically when people fall and land on an outstretched hand. A sprain to the thumb is common in skiing and other sports. This injury often occurs when a ligament near the base of the thumb (the ulnar collateral ligament of the metacarpo-phalangeal joint) is torn. The usual signs and symptoms include pain, swelling, bruising, instability, and loss of the ability to move and use the joint (called functional ability). However, these signs and symptoms can vary in intensity, depending on the severity of the sprain. Sometimes people feel a pop or tear when the injury happens. A grade I or mild sprain is caused by overstretching or slight tearing of the ligaments with no joint instability. A person with a mild sprain usually experiences minimal pain, swelling, and little or no loss of functional ability. Bruising is absent or slight, and the person is usually able to put weight on the affected joint. A grade II or moderate sprain is caused by further, but still incomplete, tearing of the ligament and is characterized by bruising, moderate pain, and swelling. A person with a moderate sprain usually has more difficulty putting weight on the affected joint and experiences some loss of function. An x ray may be needed to help the health care provider determine if a fracture is causing the pain and swelling. Magnetic resonance imaging is occasionally used to help differentiate between a significant partial injury and a complete tear in a ligament, or can be recommended to rule out other injuries. People who sustain a grade III or severe sprain completely tear or rupture a ligament. Pain, swelling, and bruising are usually severe, and the patient is unable to put weight on the joint. An x ray is usually taken to rule out a broken bone. When diagnosing any sprain, the provider will ask the patient to explain how the injury happened. He or she will examine the affected area and check its stability and its ability to move and bear weight. •You have severe pain and cannot put any weight on the injured joint. •The injured area looks crooked or has lumps and bumps (other than swelling) that you do not see on the uninjured joint. •You cannot move the injured joint. •You cannot walk more than four steps without significant pain. •Your limb buckles or gives way when you try to use the joint. •You have numbness in any part of the injured area. •You see redness or red streaks spreading out from the injury. •You injure an area that has been injured several times before. •You have pain, swelling, or redness over a bony part of your foot. •You are in doubt about the seriousness of the injury or how to care for it. Typically, people with a strain experience pain, limited motion, muscle spasms, and possibly muscle weakness. They can also have localized swelling, cramping, or inflammation and, with a minor or moderate strain, usually some loss of muscle function. Patients typically have pain in the injured area and general weakness of the muscle when they attempt to move it. Severe strains that partially or completely tear the muscle or tendon are often very painful and disabling. Treatments for sprains and strains are similar and can be thought of as having two stages. The goal during the first stage is to reduce swelling and pain. The sooner you treat the sprain, the sooner you will recover. Take a hint from the pros: By getting immediate attention, they are back out there in a matter of days. If you do nothing, keep playing and then put some ice on your ankle later that night, you will end up with a sprain that can take weeks or months to heal properly. Most of the damage from a sprain comes from the swelling. Your main goal is to reduce swelling as much as possible, and to do that, every second counts. It’s also helpful to use an nonsteroidal anti-inflammatory (NSAID) medication to help control inflammation. Studies have found that patients using NSAIDs after ankle sprains had less pain, decreased swelling, and a more rapid return to activity than those who didn’t take any medication. For people with a moderate or severe sprain, particularly of the ankle, a hard cast may be applied. This often occurs after the initial swelling has subsided. Severe sprains and strains may require surgery to repair the torn ligaments, muscle, or tendons. Surgery is usually performed by an orthopedic surgeon. It is important that moderate and severe sprains and strains be evaluated by a health care provider to allow prompt, appropriate treatment to begin. This box lists some signs that should alert people to consult their provider. However, a person who has any concerns about the seriousness of a sprain or strain should always contact a provider for advice. The second stage of treating a sprain or strain is rehabilitation, the overall goal is to improve the condition of the injured area and restore its function. The health care provider will prescribe an exercise program designed to prevent stiffness, improve range of motion, and restore the joint’s normal flexibility and strength. Some patients may need physical therapy during this stage. When the acute pain and swelling have diminished, the provider will instruct the patient to do a series of exercises several times a day. These are very important because they help reduce swelling, prevent stiffness, and restore normal, pain-free range of motion. The provider can recommend many different types of exercises, depending on the injury. A patient with an injured knee or foot will work on weight-bearing and balancing exercises. The duration of the program depends on the extent of the injury, but the regimen commonly lasts for several weeks. Another goal of rehabilitation is to increase strength and regain flexibility. Depending on the patient’s rate of recovery, this process begins about the second week after the injury. The provider will instruct the patient to do a series of exercises designed to meet these goals. During this phase of rehabilitation, patients progress to more demanding exercises as pain decreases and function improves. The amount of rehabilitation and the time needed for full recovery after a sprain or strain depend on the severity of the injury and individual rates of healing. For example, a mild ankle sprain may require up to 3 to 6 weeks of rehabilitation; a moderate sprain could require 2 to 3 months. With a severe sprain, it can take up to 8 to 12 months to return to full activities. Extra care should be taken to avoid reinjury. Reduce regular exercise or activities of daily living as needed. Your health care provider may advise you to put no weight on an injured area for 48 hours. If you cannot put weight on an ankle or knee, crutches may help. If you use a cane or one crutch for an ankle injury, use it on the uninjured side to help you lean away and relieve weight on the injured ankle. Compression of an injured ankle, knee, or wrist may help reduce swelling. Examples of compression bandages are elastic wraps, special boots, air casts, and splints. Ask your provider for advice on which one to use, and how tight to safely apply the bandage. • Vitamin C (250 to 500 mg two times a day) is important for keeping collagen, ligaments and tendons strong. It helps reduce swelling, repair tissue, support connective tissue and promote proper healing. • Omega-3 fatty acids can help reduce inflammation which is important for strains and sprains. • Bromelain (250 to 500 mg three times a day between meals) can help reduce swelling. • Turmeric (250 to 500 mg three times a day between meals). If taken with bromelain, it can make the effect of bromelain stronger. • Zinc (15 to 30 mg a day) promotes wound and tissue repair and is very important for bone health. • Calcium (1,000 mg a day) and magnesium (500 mg a day) are very important for bone and muscle health. •For pain relief, the Chinese herbal plaster, Shang Shi Zhi Tong Gao, is very effective. 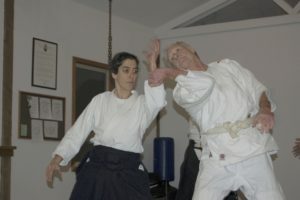 This is an interesting interview of Chiba Sensei (by Stan Pranin) that was recently posted in the Aikido Journal. Kazuo Chiba: Well, I liked budo quite a bit, especially judo. One day I happened to find myself in a situation where I had to fight a match with one of my seniors who was a nidan. He was a fine person who had taught me quite a bit about judo ever since I first entered the dojo, and he had been good to me in matters outside the dojo as well. He had a small body but he did marvelous judo, and could throw larger opponents without using any power. He used a lot of taiotoshi (body drop) and yokosutemi (side sacrifice) throws of a caliber you don’t see much anymore. He was very fast, too. 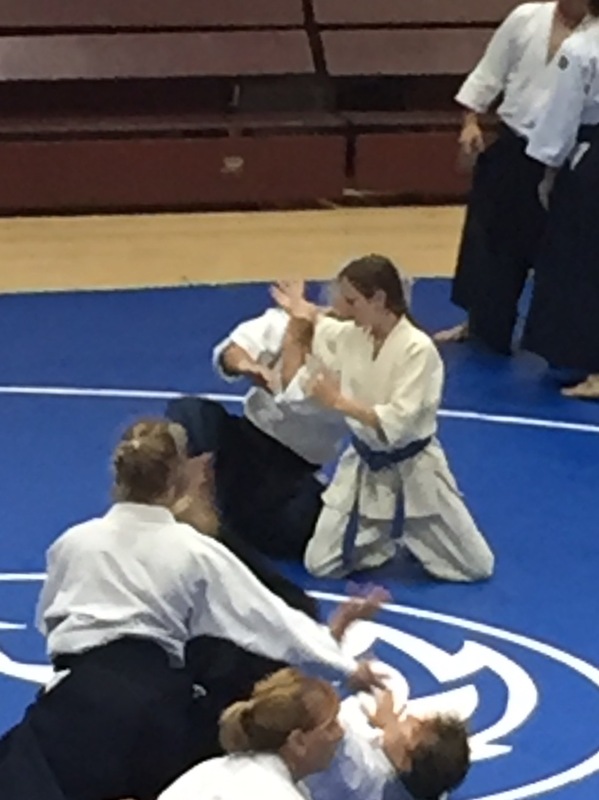 He used to beat me all the time, but then…………..
Biran Online wishes to thank Josh Gold Sensei for graciously giving permission to excerpt and link to the Aikido Journal. I first met and trained with Frank Apodaca Sensei in Michigan in 2002. He had established and was then operating Mid-Michigan Aikikai in East Lansing, MI. I had recently moved to Ann Arbor, MI, two hours drive from East Lansing, and had had the good fortune there to meet and train under Rodger Park Sensei, my root teacher, at Huron Valley Aikikai. From 2002-2004 I benefited greatly from regular group training with these two dojos and consider Apodaca Sensei’s instruction an inseparable compliment to the excellent foundational instruction that I received from Park Sensei then in the early years of my martial arts training. These two teachers consistently demonstrated friendship, deep respect for each other and for students, and a high level of technical instruction. They also happen to both be great guys! I am currently a member of Clallam Aikikai, in Carlsborg, WA, benefitting from the vast experience and excellent instruction of Neilu Naini Sensei. Due to her efforts, our dojo was lucky enough to recently host a full weekend seminar lead by Frank Apodaca Sensei, Shihan. 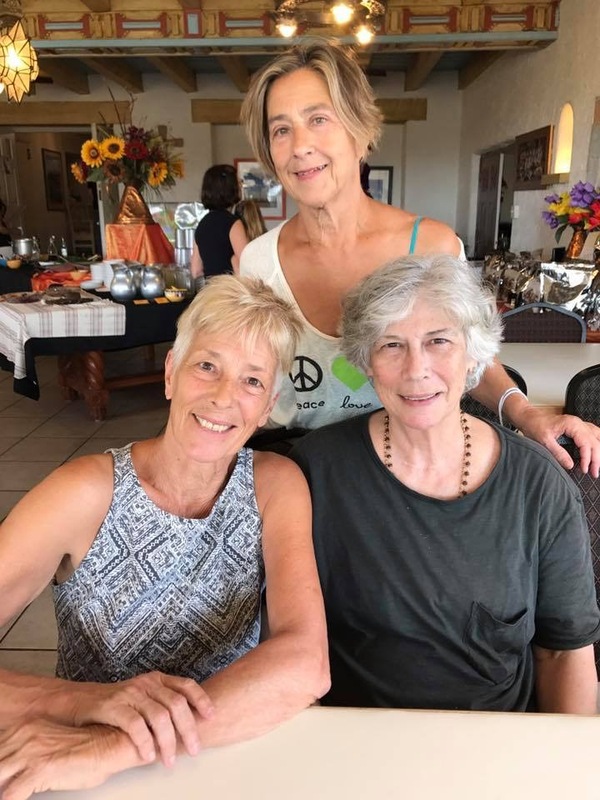 When I consider the teaching style of Apodaca Sensei as I have experienced it, I am first inspired to comment on the relaxed, confident power that he so gently, and effectively, displays. His mat presence inspires me to give more fully of myself in training. He is always smiling. His utilization of illustrative example from walking life, and especially from other martial arts, helps to open and deepen Aikido study; His instruction is always rich with just the right amount of technical information to perfectly compliment established, overarching themes. Some highlights I (hopefully) took away from Apodaca Sensei’s recent instruction at Clallam Aikikai include: A detailed description of the importance of knee/forearm cross-substantiality necessary to soften and protect the affected shoulder while taking ukemi during ikkyo and kata gatame, and how this positioning preserves mobility and increases safety; On cutting, to cultivate the relaxed “zero point” also crucial to accurately discharging a firearm, or throwing an effective punch; and the necessity of full, dynamic balance taking in ki no nagare. Apodaca Sensei reminded us that self-care is of paramount importance as we work to maintain our bodies and bring longevity to our training. A generous section of seminar instruction was dedicated to the application of a Systema method of partnered whole body muscle/nerve therapy. Like many members of our community, managing chronic pain and acute injury is an ever present part of my personal practice. I am always encouraged and refreshed when this aspect of martial art is addressed directly on the mat, and especially by an instructor of such high level. Off of the mat, Apodaca Sensei’s unassuming, approachable personality greatly contributes to a warm, welcoming sense of community. This feeling, in my opinion, indicates good health among a group of practitioners and is an excellent example of the potential to enrich human relationships through the martial arts. A huge “Thank you!” to Sensei for traveling across the country to be with us in Washington for the weekend! Please return as soon as you are able! And to aikidoka not already aware, absolutely do not miss any opportunity that you may have to benefit from the instruction and example of Apodaca Sensei. The November Issue of Birankai Europe’s Newsletter includes an interview with Chiba Sensei on the contradiction between diamonds and rocks and order and freedom. 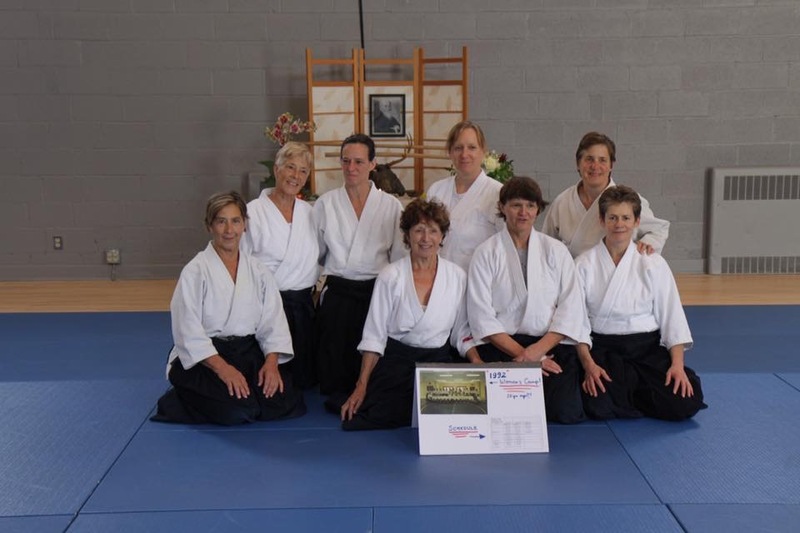 In September I was fortunate to have the experience of attending the Women’s Aikido Camp in Santa Fe, New Mexico. The travel to the event was a story all on its own. Missed flights, multiple rerouted gates, and lengthy wait times (an extra 8 hours), were just some of the events that made the travel to Camp a hilarious story. However, my experience of Camp outweighed the travel to and fro. As I usually do when attending an event, I made an agreement with myself to let go of expectations. Life is too unpredictable to come loaded with desire. I had never been to an all women’s anything before (with the exception of a few girls’ nights here and there, but nothing of this magnitude). So I arrived with an open heart and mind and an intention to train hard and do my best. Our rerouted travel kept us from attending the first evening class. We arrived by shuttle in the dark, to the retreat center where Camp was held. Showed to our room by Varjan Sensei herself, we were delighted to discover comfy beds and cozy furnishings. A good night’s sleep was definitely in store for myself and my dojo mate, Marci Martinez. The next morning we awoke to a perfect view of the high desert, and then were even more astounded by the breakfast buffet. After homemade granola, fresh greek yogurt, organic fruits and juice options, good coffee, scrambled eggs with meat or vegetarian options, we practically rolled ourselves back up to our rooms to dress and go to the dojo. The dojo was a simple yet quality setup in the gym of the retreat center, with long, tall windows at the top for great natural light, and doors at either end to keep the air flowing. I walked in noticing the calm air. Not the calm-before-the-storm kind of calm, more like the quiet peace you find after the space of meditation. There was an inherent unhurried-ness coupled with the power of being a martial arena. 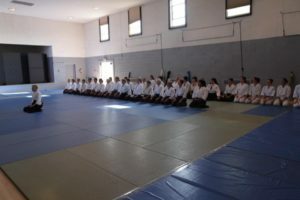 Being one of the first to arrive on the mat, I noticed the energy shift as more women arrived. Having no expectations, I observed, interested to see how this was going to play out. Turns out, it began seemingly no different than a seminar where our brothers were in attendance. We lined, up, we bowed, we entered training with a confirmed sense of martial awareness. With skilled teaching, precision ukemi, and a relatively crowded mat, we trained hard. Technique followed technique, one after another, sweat abounding and egos aside, we trained in body arts and weapons. It wasn’t until someone triggered a recognition in my head by saying, “So this is what it feels like when there is no testosterone on the mat” that I even noticed a difference in the energy of the room. There was a difference: a subtle, yet powerful, transcendence of this hormonal variation. It is challenging for me to describe, because it didn’t feel like anything was lacking, and it didn’t feel like an abundance of estrogen either. It just felt, well, softer. When I say softer, I don’t mean less martial, or easier training. I refer to a feminine energy, the type of energy you feel when you know you are being cared for and supported, yet held to a high standard, like that of a grandmother with her grandchild. Yet there certainly remained a requirement for all present to challenge themselves in their training, an element inherent to progression, regardless of gender, or of the gender of training partners. Throughout the remainder of Camp, we went in this fashion: delectable meals, phenomenal teaching, sweaty gi, heavy sleep. We had some nights with evening discussion. It seemed a communal agreement that group meetings were something we could take with us back to our home dojos, and to our greater Aikido community. Many topics were discussed, but there seemed to be much discussion around misogyny. I should comment that after hearing some of the stories that my fellow women Aikidoka have experienced, I feel grateful to not have had the circumstance of discrimination alive in my dojo or at any seminar I have attended. However, it was an obvious issue for other women, leaving me surprised at the reality of it. Male students and teachers have always been fair-minded towards me, however it seems not the same way for all women. Please don’t misunderstand and come to the conclusion that this was a man-hating event. There were many topics discussed, but because of the alarming nature of this topic, I choose to write about it. Due to my own ignorance, naivety, or both, I had never thought that women were managing discrimination in this way. Out of respect for the women attendees, I won’t go into details, but there were a range of patterns and actions brought up. I think it is enough to just mention it in this platform, to bring awareness to the topic. It seems likely to me, that after merely reading that misogyny is an issue for some of your fellow Aikidoka, that the reader will bring this awareness to the mat with a heightened sensitivity for fair minded-ness. That is all I am asking here, for the blessing of bringing awareness to training. Training is already challenging, let us keep it as simple as it can be without adding any friction to it. O’ Sensei instructs, “Training should always be conducted in a pleasant and joyful atmosphere.” With this in mind, it may be easy to maintain his request, because with any type of discrimination comes the difficulty of managing the response. Let us be easy on ourselves and each other, free from bias and judgments, allowing each person their right to train in a safe and joyous environment. After four days of amazing training, Marci and I headed back to the airport. Thinking we would arrive with no problems, our shuttle ran out of gas on the highway. Ironically, our rescue shuttle, once we were all loaded up, would not start. We joked about how our travel was cursed this trip, when all of a sudden, after half an hour of waiting on the rescue shuttle, and half an hour of sitting idle with the clock ticking to get to our flight on time, the shuttle van miraculously started. We arrived with literally five minutes to spare, made our flight, and nestled into the plane hilariously awaiting another debacle. But the trip home was fine with no other events. With a head full of new techniques, new friendships and life lessons, I returned home a happy Aikidoka. thermodynamics, radiation; it’s many processes, all overlapping and influencing each other. We can study it, characterize it and make predictions about it. The same way that we recognize many patterns in weather, we learn how to recognize patterns in qi, so we can influence bodily functions and promote health. different areas of the brain and spinal cord. Acupuncture causes an electrical distortion in the body’s electromagnetic field—you’re putting a metal needle into an ionic solution (the body) which immediately creates an electrical polarity. The micro-injury caused by needling and moxa heat is also a very powerful method of stimulating the immune system and cytokines (chemical messengers). Plus, with acupuncture needles you can physically loosen tight muscle and connective tissue to release restrictions and improve blood flow. dealing with complexities that resist the scientific method, it has withstood a very important test with its continued use over such a long period of time. acupuncturists call the “arrival of qi”. To me it’s like a density on the end of the needle, like it’s connected well. Learning to recognize it is part of our craft. Bridge Acupuncture, located at 30 Garden Alley, in Doylestown, is a Legacy Advertising partner of Natural Awakenings of Bucks and Montgomery Counties. 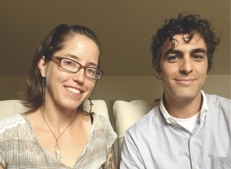 To schedule an appointment with Paolo Propato or Grace Rollins, call 215-348-8058 or visit BridgeAcupuncture.com.